A truly rare sight, the cirrocumulus mamma got its name from the altitude and main composition as well as its unusual shape. Therefore, because it is part of the cirrocumulus family, this cloud pattern is mainly composed of solidified water droplets in the form of ice crystals at altitudes of over five thousand meters above sea level. The mamma attribute is a Latin name that indicates the shape of a woman's breast. Consequentially, these cloud patterns are represented by a standard cirrocumulus cloud that presents rounded and full formations at its base. From this point of view, the mamma can be considered an adjacent or accessory cloud of a standard cirrocumulus. 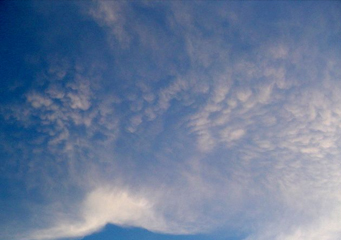 How are cirrocumulus mamma clouds formed? Even though currently there are several theories regarding how the mamma cloud structures are formed, a commonly accepted hypothesis is that their development is caused by a reversed direction convection process. In general, it is considered that this accessory cloud is mainly composed of moisture and water droplets that are able to maintain their liquid form due to constant rising of a mass of warm air front. When the hot air reaches the cooler temperatures in the troposphere it causes them to expand horizontally in cloud free areas of the atmosphere. In addition, meteorologists believe that the temperature difference between the rising warm air and the chilly temperature at that altitude creates instability that permits the convection process to take place downwards. Moreover, the development of these clouds as well as their weight are also two of the responsible factors that create those equally proportioned lumps. What do cirrocumulus mamma clouds look like? How common are the cirrocumulus mamma clouds? The mamma cloud formations are mostly common in the warmer months of the year. Considering that cirrocumulus is a structure that is prone to develop mostly during winter, sky gazers can observe the mamma clouds regularly in mid spring or early fall. However, they can also develop under cirrocumulus clouds whenever there are grounds for weather instability caused by the summit between a warm and cold air front. In fact, this is one of the reasons why people commonly associate them with preceding tornados. However, it is important to note that this is more common for the mamma accessories that are formed lower in the atmosphere, specifically the cumulonimbus clouds.